IS THERE A WORLD TO COME ? It took me months to make up my mind to write this review. In September 2014, I was at Casa Rui Barbosa, in Rio de Janeiro, attending an international seminar titled “The Thousand Names of Gaia” — a meeting in which thinkers from different countries reflected on the climate changes and on the global environmental crisis. I confess that I left the event so changed in my way of thinking that I could not write, immediately, as I had planned, a commentary on the book “Is there a world to come?” which was released during the colloquium. What was lacking was not any skill to understand, indeed, I could not muster the proper affection to comment on the book; also, I lacked a better grasp of Déborah Danowski and Eduardo Viveiro de Castro’s critical pessimism. It was something quite vexing for me to accept that we live a devastating planetary crisis, and to tread definitely on this theoretical ground. I believe that it is in and from such acceptance, that something new can come up, at least at the level of thinking. 1) The great difficult we have of thinking about what is going on not only in Brazil, but also around the world. There are not many articles and books which try to figure out, from a transdisciplinary standpoint, what we are living nowadays — since all the “pundit’s words” turn out to be straightforwardly limited. These pundits spot the ‘scapegoat’ now on the politics, now in the economy, or in the corruption, or in the inflation, and so on, as if all the disciplines, and all the specialisations of which we have been proud for so long, suddenly they had become the real obstacle. 2) The second issue is the existence of a collective dream, a shareable utopia that could allow us to canalize the creative energies to a tomorrow, a coming future. How to live without dreaming collectively? Or else, is it precisely due to our inability to think and dream that the new possibilities are making themselves known? What can come about out of this pessimism? A new way of exercising oneself politically? Anyway, this is a rather contemporary uneasiness, a discontentment that cannot be apprehended via Sigmund Freud (FREUD, 1983) or Zigmunt Bauman (FREUD, 1983). The uneasiness in the civilisation goes on, but the extension of its concept is pressing and I found this extension in a book recently released by Christian I. Dunker. There, the author presents the idea that such ‘uneasiness’ is a sort of black hole in our practices of naming, that is, the uneasiness (Unbehagen) is, at the same time, a counter-attraction trying to find a name for our precarious position in the world and a name for the recurring failure in this very practice of naming. It is on this pervasive uneasiness that we are going to focus bellow. The issues that have stolen my sleep will work as a sort of reading guideline for the interviews, articles, and for the book by Déborah Danowski and Viveiros de Castro, “Is there a world to come?” — a difficult book that is paradigmatic of a new thinking. By reading it, I could, surprisingly, understand a little bit more of the two first issues I mentioned earlier, and I was able to see not only the danger but also the opportunity implied when we stop thinking with the categories proposed by modernity, and when we stop engaging in the utopic dream of a new society — at least not in the same way we used to dream until then. Let me explain myself: Viveiros de Castro is an anthropologist and Danowski is a philosopher, and that makes things harder when it comes to qualifying this book. I read as an ethnographic register of the West, interwoven with a myriad of disciplines — literature, cinema, philosophy, physics, chemistry, climatology, geophysics. Nonetheless, this gigantic mass of knowledge presented to us is safe in the hands of both authors, who are familiarized with the several manners through which the diverse human cultures imagined the disarticulation of the space-time scales from and in History. Philosophy has such familiarity, and anthropology, as well. Then, the impressive amount of knowledge the authors provide us with is under the aegis of the philosophy, of the anthropology, and of the ‘ethnographic present’ as they define this concept that I hope to make clear throughout this post. As we go on, let us keep in mind that, starting around the 1990’s, thermodynamics changes brought to surface current discourses about the ‘end of the world’ — and the authors take those discourses as thought experiments. As says Bruno Latour, it is necessary to read Is there a world to come? as if we were taking a freezing shower so that we could get used and get ready for the worst. I present the reader an image that might account for part of what I said above: many thinkers read the world from the beach, others read it from the seabed, and Viveiros de Castro and Danowski read the world from the standpoint of the breaking waves. Moreover, let us bear in mind that some waves do not break: they recede and the undulation regain its calmness. The place where the waves break is an absolutely uncomfortable one, a nowhere, the end of a world and the bits of meaning of a new world. For these authors, however, this nowhere looks like a very comfortable standpoint. It took me months to review that book, precisely because I could not fathom the subjective place the authors were talking about. Besides, when I managed to name it metaphorically, I had tremendous difficulties to calibrate myself to this impossible spot. 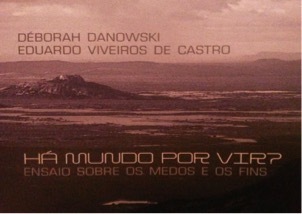 The authors are visionaries and that is why, contrary to those who are on the beach, or in the seabed, both Viveiros de Castro and Danowski devise new possibilities to read, experience, and think of the world. If we intend to think a new thinking, we have to learn with Viveiros de Castro and Danowski, not only about the contents — far from it! –, but also about the subjective place they inhabit, a nowhere, a point where the waves break and, sometimes, ”don’t go for broke”. It is from this viewpoint that we let go all those disciplinary fields and we let ourselves be impregnated by multiple prospects. It is in this subjective standing that, maybe, a new perspective, still in incubation, inhabits. This subjective place shall become our new standing! THE CATASTROPHE ALREADY HAPPENED: INTRODUCING THE BOOK. In 2000, the American biologist Eugene Stoermer and the Dutch chemist Paul Crutzen, Nobel Prize winner in 1995, proposed an alteration change in the timeline on which the scientists measure the aeons, eras, and geological periods, so that they would allow for the transformations the planet has undergone due to human activities. Stoermer and Crutzen called the period Anthropocene — this would take us from the Holocene, which started twelve thousand years ago, at time of the last glaciations. In the Anthropocene, Homo Sapiens is no longer just a mere biological agent, it is ‘upgraded’ (or downgrade?) to the status of a geological force whose actions will be visible for millennia: abrupt variations in the atmospheric composition, tons of plastic, radioactive waste, and other traces of our devastating passage over the Earth. Even though the Anthropocene had started with us, it is high probable that it will come to an end without our presence. In this sense, the Anthropocene “is an epoch, in the geological sense of the word, but it points to the closing of an ‘epochality’, as such, in relation to the species” (DANOWSKI; CASTRO, 2014, p.16). One questions when the Anthropocene would have begun: in the Industrial Revolution? Has it been intensified after World War II? There is no consensus. Danowski and Viveiros de Castro starts by the end: the catastrophe has already taken place, and with it, the suspension of all the ways as the time used to go by. There is no reason, scientifically speaking, to ask ourselves if the climate changes are real or not, if they are anthropogenic or not, nor if these consequences are disastrous or not. All this is widely accepted by the scientific community, or else, at least by most of it. What is open to debate is the dimension of such phenomenon, the speed in the temperature increase, the melting glaciers speed, the rising of sea level, and what will be the effects on food production and its implications on social and political issues. Nowadays, what really matters is to try, and figure out, if there are ways out of the catastrophe — and where we can find them. With the Anthropocene, other issues come to the forefront, once this period promotes a collapse of scales, and both the history of the planet and of the human species, which were previously dealt by diverse disciplines, now they merge, in Viveiros de Castro words: “capitalism turns into a paleontological episode”. That is to say, if we understand to the end that the human species has become a geological force, our conceptual bases will crumble, and they are already crumbling down, among them, the fundamental distinction of the episteme, which has ever — at least since modernity! — distinguished the cosmological and anthropological orders, as well as the human history from the natural history. Danowski and Viveiros de Castro write: “…the first name (they refer to the ‘Anthropocene’) designates a “new time”, or rather, a new time of time — a new concept and a new experience of historicity — in which the difference has drastically decreased when it comes to the magnitude between the human history scale and the chronological scales of biology and of geophysics. The environment has been changing faster than the society, and, as a result, the near future becomes, not only increasingly unpredictable, but perhaps even more impossible” (DANOWSKI; CASTRO, 2014, p.107). The Belgian Isabelle Stengers coined the expression “Intrusion of Gaia”, retaking Lovelock, in order to characterize the irreversible irruption of the planet in our lives’ foreground: “Gaia is the event that put our world in danger, the only world we have, though” (DANOWSKI; CASTRO, 2014, p.143)”. Again, Danowski and Viveiros: “…the second name (they refer to Gaia) defines a new form of experiencing the ”space”, drawing attention to the fact that our world, the Earth, turned, on the one hand, suddenly exiguous and fragile, and, on the other hand, susceptible and relentless, it has assumed the appearance of a menacing potency which evokes those nonchalant, unpredictable, and incomprehensible deities from our archaic past. Unpredictability, incomprehensibility, a feeling of panic before the loss of control, if not the loss of hope: these are the newest challenges, unprecedented challenges for our haughty intellectual safety of the modernity” (DANOWSKI; CASTRO, 2014, p.143). In the view of Bruno Latour, the System Earth, hereafter, threaten us as a historical subject, a political agent, a moral person. Connected to these two concepts-experiences, time-space, there is a diffuse and growing feeling in the contemporary culture, a feeling that the elements of our myth-anthropology, the ”humankind”, the ”world” (the species and the planet, the societies and their environments, the subject and the object, the thought and the being, etc.) they have — the authors tell us — got into a nefarious cosmological conjunction associated to the names of Anthropocene and Gaia. The first chapters in the book focus on the ongoing philosophical, literary, and cinematographic abnormalities — some we know, others we do not, but all of them are shocking and they are symptomatic of the present state of alarm and unrest. The empirical sciences — climatology, geophysics, oceanography, biochemistry, etc. they are invited to give their frightening testimony of the “upcoming barbarities” (Stengers). The philosophy — even the metaphysics — go about probing and thinking over the ends of the world, the incompatibility between the humans and the world, and what comes up as the likeliest winner is a “world without us” — a world subsequent to the end of the human species existence. The entire imaginative arsenal from several areas of knowledge concerned with the perspective of the end of the world, which are brought up by the authors, coincides with what they call “ontological turning” (DANOWSKI; CASTRO, 2014, p.32). As Gunther Anders said, whilst referring to the “metaphysics metamorphosis” after the bombing of Hiroshima and Nagasaki, “the absence of future has already started”. Having passed a couple of decades now since Anders’ proposition, we can say that, if the Anthropocene is our time, it is a time without future, and that the way time used to go by has been entirely changed. Part of the book is devoted to the Amerindian myth cosmologies, and with their multiple imaginaries of the end of the world. In the Amerindian cosmogonies, the human is empirically precedent to world itself, as in the Aikewara Myth: “When the Sun was too close to Earth, there wasn’t anything on the world, just people and land tortoises.” The mythical action elapses along a time in which “there wasn’t anything, but there were people already”. Everything was human at the beginning. The authors write: “…a considerable number of Amerindian myths, and, maybe, a little less common, of many other ethnographic regions, they imagine the existence of a primeval humankind (whether it is simply presupposed, whether it is fabricated by a demiurge) as a substance or matter out of which they would have been made up” (DANOWSKI; CASTRO, 2014, p.87). By a spontaneous manner, that original human race start to change into a becoming-other: into the geographical accidents (landform), into the meteorological phenomena, into the heavenly bodies, into the biological and vegetal species. It is “the time of transformations”, always unfinished, though. The part of the primeval substance/matter that did not transform itself is the historical or contemporary humankind. The Amerindian people has necessarily other notions of ”nature” and of human race/”culture”. As most people who could never be ‘modern’, the correlation between those two terms does not make any sense for them. By not dealing with such opposition (nature x culture), we have a very much special access to the difference with which we equate the world, and to the reason why we destroy it. At the very core of this debate, we find an important philosophical distinction: the Amerindian anthropomorphic principle and the western anthropocentric principle. In the last part of this post, we will come back to this discussion. The Amerindian cosmologies foresee the end of the world, too. It is done by either “the fall of the sky” (according to Kopenawa, the Yanomami chief) or by fire or even the water: there are several cycles of destruction and recreation of humankind and of the world. Suddenly, we curiously find out that the disquietudes of the ancient cosmologies already do not appear to be so baseless! However, in the indigenous mythologies of the end of the world, it is simple unthinkable a world without people, without a human race no matter how much different it maybe from ours: “…The destruction of the world is the destruction of mankind and vice-versa; the recreation of the world is the recreation of some sort of life, that is, the recreation of some kind of experience, and as seen earlier, the form of all life is human…” (DANOWSKI; CASTRO, 2014, p.102). They, the Amerindian people, who faced ends of worlds carried out by westerners, since the discovery of the Americas, they allow us to understand, at last, a ”us without the world” — a humankind without world or environment, from whom the basic existential conditions would have been subtracted. In the book’s following chapters, the authors move on to politics, and with as well for it, they evoke a burning mobilisation of all the collectives who are already aware of their lack of time. An abrupt and blunt “intrusion of Gaia” in the human horizon means that the catastrophe has already occurred, and with it, the hyper-objects which are impossible of been thought of. The hyper-objects are special objects, new objects which challenge us, rather, they challenge the perceptions we have, or that the common sense has, of the time and space ”because they are distributed in such a way around the globe that they cannot be directly apprehended by us, or because they last or produce effects whose duration goes extremely beyond the known scale of human life”, says Déborah Danowski, having as reference Timothy Morton (The Ecological Thought, 2010). To Danowski, the hyper-objects are the climate change, the global warming, the use and the effects of plutonium, the nuclear war. Another example given would be the radioactive materials, plutonium 239, whose average lifespan can reach 24.100 years, that is, its use and effect last longer the history of human writing. The effects are slow, scattered, and disconnect among them. Gunter Anders and Hans Jonas had already envisaged the radical disproportion between cause and consequence, made possible by the mightiness of modern technology. The hyper-objects take such disproportion to the last consequences — and, because of it, for sure, we are already not able to think them over, any longer. Add to that the so-called tipping points: points of no return, once certain alterations feedback others. That is precisely what Isabelle Stengers call, as we saw earlier, the intrusion of Gaia! A hyper-object such is the case of the global warming, or of the climate changes, has slow effects. Large populations are obliged to leave their land, their countries, before; finally, one says, “well, the climate changes are already here”. A hyper-object is better understood as something tangible long time after it is already placed. Just the same, we are all in suspense: the scientists who know and foresee the catastrophe and the average Joe who even feeling the contemporary uneasiness — as defined by C.I. Dunker — only long after the happenings might figure, out and give a name to what is going on. It is a fact, notwithstanding, that before the hyper-objects we no longer can think in the same fashion as the western culture has thought during millennia, especially in the modernity! Following Danowski’s trail, I am going to juxtapose two hyper-objects: the nuclear war and the global warming/climate crisis. By doing this, I not only introduce the difficulty to think over hyper-objects, but I also show the deconstruction of the western thought categories, particularly the modern thought category which is just a derivation, mainly if we keep in mind the second hyper-object. Such exercise turns explicit the radical change we are going through. In 1955, Russell, Einstein, and other, subscribed to a Manifest that contained a warn to the world on the dangers of a nuclear war, because, for the first time in history the human species had made available the technological means to destroy itself. Now, the warning was made public because a world war with the generalised use of nuclear bombs could only lead to an outcome: the end of human race. The Manifest did not mention nature, nor any other forms of life beyond humankind — except the contamination of water and people after Hiroshima! Let us consider the fact that nowadays we inhabit another world, just seventy years after that! “Today, when one talks about environmental crisis, one cannot leave aside the detail that, without other forms of life, the human species would even exist […] and that the massive extinction of other species very likely would mean, by itself, our own extinction”. That is to say, in less than seventy years, with the emergence of the hyper-objects such as the climate changes, our utter abandonment is exposed! We, who used to be everything, I refer to the humankind, the thinking species, the only one to have access to the spirituality and to transcendence, with the right to rule over all the other species as well as over the Earth — that, instead of being just a dwelling place became a fountain of “natural resources” ready to be voraciously explored; we, who was everything, I was saying, at once we’ve become vulnerable beings, dependent on the other species, and threatened by the destruction we’ve been bringing about. There was an unforeseen discovery, something hidden behind the anthropocentric idea guide: the man at the centre of the creation since the biblical Genesis, with the right to everything, to make use of nature as better pleases him. An idea guide which is also held by both Philosophy and by Metaphysics, so that it isn’t by chance that Nietzsche, and after him, Heidegger, located modernity philosophically in the ancient Greece, with Socrates and Plato. The zenith of this historical and philosophical route took place in the modern era, when God ”died”, according to Nietzsche — and the modern man, somehow, took on the position. During the nineteenth and twentieth centuries, multiple criticisms towards modernity were staged; nonetheless, anthropocentrism seemed to be an immovable stone of the modern philosophical apparatus. At any rate, the climate crisis and its impending threat calls into question, definitely, the place occupied by man in the Western history and shows a living web, which makes our life possible, the outright humankind’s dependence on the other species. HARD TO THINK: THE DECONSTRUCTION OF OUR CATEGORIES OF THOUGHT. The “global system”, which is the result of the techno-scientific revolution — was already overturning our grasping of the modern world. Zigmunt Bauman, in many of his books, insisted — in the end of the last century and beginning of this one — on the transformation of time and space. That “escape” of time and space has only stepped up even more at every day. The experience we have been doing with time is one of uncontrolled acceleration. “Time is off-axis and moving faster and faster” (DANOWSKI; CASTRO, 2014, p.19). The time as the manifestation of change which seems to be not only accelerating, but also changing itself qualitatively, “the whole time” (DANOWSKI; CASTRO, 2014, p.19). For the authors of “There is a world to come” there is a blend of meta-temporal instability with a sudden insufficiency of world (…) generating on all of us something similar to an experience of decomposition of time (the end) and of space (the world) (DANOWSKI; CASTRO, 2014, p.20). One of the ways to say that our world is becoming less Kantian. Isabelle Stengers called, as we’ve seen, this new reality ”intrusion of Gaia” and with we can no longer keep none of our references — at least if we keep in mind that historical period that cannot be called Modernity anymore. At once, all those concepts with which we used to equate the world, such as ‘nature’ — a cold, everlasting, removed figure able to dictate its laws to all and every human actions — well, those concepts pale once we try to grasp something of what is happening, we have to let they go, once it does avail us any longer to equate the world starting with the man, the Man (with a big M), this “ontological exception” capable of reducing the whole world to himself in a narcissistic hallucination. The modern subject translated what he calls nature, society, culture, and psyche into law (scientific) and this order (scientific) mirrored him, silencing the world with the stamp of its authorship. Silently, the entire world responded to that imposition let itself be shaped, fabricated, produced. This production widened the domains of what we call “human creation”: making of it, of such creation, a mere narcissistic exercise of the will to control, which changes all the things in its mirror, and him-self on the reflex of his objects of consumption. As said Kopenawa, the whites “fell in love” with their own merchandises and they are “imprisoned” in them and by them. The anthropocentrism, whose apex was reached during modernity, is at stake. When the Anthropocene and Gaia come into play, it is needed a reconfiguration of the notion of humankind — whilst it is seen as a single and universal essence — and of world. With the intrusion of Gaia without our planning, as well as the experience that the intrusion has imposed on us henceforth — an inexorable and mute experience — our modern thought references are rolling downstream. The intrusion of Gaia do not allow us to think in the same way as we have been thinking for, at least, the last two and a half millennia. IS THERE A WORLD TO COME? The most interesting detail in the book which keep prompting me is to how to take into account the “turning of the Western anthropological adventure towards its decline” (DANOWSKI; CASTRO, 2014, p.17) — and together with it, the multiple current discourses about the end of the world — considering its potency! Let me explain: we destroy the planet and the life on it just because our imaginary is guided by the science and the technique at disposal of a ravenous impulse: the economic growth and the productivity — in short, the progress. The humanist optimism had promised us unlimited growth in the last four centuries. Now, all that we saw, in the previous items in this post, bring up what seemed to be excluded from the horizon in our history: “…the downfall of our global civilisation, due to its undisputed hegemony, stages a fall that might drag with itself considerable parts of the human population” (DANOWSKI; CASTRO, 2014, p.12). Even the entire human species — the very idea of human species is being touched by the crisis! — peoples, cultures, and societies which are in the origin of the crisis, and many thousands of other lineages of living beings, all endangered by the environmental changes caused by the hegemony of the “world system”. The idea of a hyper-progress, of the colonisation of other planets — an extra planetary expansion that will render the species independent of any world and will “set us free” from the boundaries of nature/Gaia, it is something very popular currently — and does not limit itself to the trans-humanist scientists — it is highly common to hear it from the average people on the streets. We do not stop believing in our civilizational potentiality. This is our crossroad: stuck to the imaginary we keep the faith that the poison is our cure and we do not wake up! In different moments, throughout the book, we get in touch with the guerrillas, the unexpected resistance: “slow science” of Isabelle Stengers — the only thing that it’s necessary to accelerate in the “barbarity to come” is precisely “the process of de-acceleration of the sciences and of the civilisation which, in more than one sense, lives at its expense” (DANOWSKI; CASTRO, 2014, p.119). It’s likely that “…it’s us, the peoples of the Centre, with our societies of ‘advanced’ technology, inhabited by obese automata, mediatically guided, psychopharmacologically stabilised, dependents on the monumental consumption (or waste) of energy (…) it might be us, in short, who will have downsize our lifestyle, decrease the scales of our comfortable living standards “. (DANOWSKI; CASTRO, 2014, p.127). On this account, we are living an inscrutable nightmare: we were invaded by ourselves — or by a part of us — we are the invaders and the colonizers who carry out the end of the world. If the very notion of anthropos, as a universal subject (species, class, crowd) is in check, it follows that the intensive and extensive multiplicity of people and its diversity of political alignments — of the peoples, of the world cultures, and of the nonhuman peoples — all and everything is implicated in the crisis of the Anthropocene. That is the origin of the war of worlds or wars of “Humans” (the Modern people who believe they will be able to continue to live in the unified and indifferent nature of the Holocene) against the Earthians (the people of Gaia) described by Bruno Latour. We are not dealing here with two blocks, because the authors’ proposals are much more nuanced than my presentation here. Still, according to Latour, whom do Danowski and Viveiro de Castro cite “…to speak straightforwardly, some of us are preparing ourselves to live as Earthians in the Anthropocene; others opted for continuing us Humans in the Holocene…” (DANOWSKI; CASTRO, 2014, p.123). The problems for many people is to bring the “Humans” to the side of the Earthians. Moreover, I want conclude this part with the authors’ propositions in relation to whom are the Earthians: the people to come, able to set up a “resistance to the present”, thereby creating “a new Earth”, a world to come. All the criticism and the new perceptions are made possible because, as I said earlier, the authors put themselves, subjectively, where the waves break. Moreover, as we already noted, some waves do not break, they do not ‘go for a broke’, and they recede and give up their will to be waves, going back placidly to the calmness of the ocean. This subjective place, where the “waves don’t go for a broke” is also occupied by the authors and it correspond to the “ethnographic present”, which we alluded to in the opening of this text. Danowski and Viveiros de Castro make use of the concept — “ethnographic present” — in a new and surprising way, once they use it to designate the attitude of the “societies against the State” before historicity. They write: “… the ethnographic present is the time of Levi-Strauss’ ‘cold societies’, “societies against the accelerationism” or slow societies (as in ‘slow food’ and ‘slow science’ — Stengers), societies which understand that the all the cosmopolitical changes needed for the human existence have already taken place, and this is a task for the etnos to make sure and reproduce such ‘always-now’ (DANOWSKI; CASTRO, 2014, p.91). Put differently, what matters is to assert the ethnographic present, preserving it, or recovering it, not to “grow”, “progress”, or “evolve” (DANOWSKI; CASTRO, 2014, p.103). Calm down, calm down with a “technology of braking, a dis-economy freed from the continuous growth hallucination, and a cultural insurrection against the zombification of the citizen-consumer” (DANOWSKI; CASTRO, 2014, p.130). That is to say, as the Andean people preach: “vivir bien, no mejor”. There we have the subjective place which the authors occupy in the undertow: the “waves that don’t go for a broker” — the ethnographic present — and there staying, they open the really new perceptions of this book, bring to the surface the huge minority of peoples who never were modern, among them, the Amerindians, and with them, their ways of being and of living together, their Earthians techniques, not the state-of-the-art of the technology yielded by the Big Science; their philosophy, the anthropomorphism, and not the triumphant anthropocentrism. That is to say, with the ethnographic present, the authors set forth a strange — and until not too long ago, whimsical — “…continuity to come from the modern present with a non-modern past…” (DANOWSKI; CASTRO, 2014, p.30). If philosophy and anthropology have offered us, since modernity has come into play, a vast array of discourses against themselves, deconstructing ones to the extreme, not even so they managed to open a window which would definitely make possible a new landscape. Now, keeping their eyes where “the waves don’t go for a broke”, and taking advantage of the earthian peoples’ philosophy, especially from the Amerindians (I refer to anthropomorphism here) the window so much pursued gets wide open, and really, just to joke around with the authors, we don’t know if the most excited demonstrators on the streets of Spain, United States, Brazil, if they’re ready for so much openness! I cannot resist any longer and I am going to conclude by using a passage from the book concerning the Amerindian philosophy, which asserts, “everything is already alive”: “In this sense, the anthropomorphism is a complete (dialectic) and ironic inversion of the anthropocentrism. To say that everything is human is to say that the human species is not a special one, an exceptional event that came up in order to interrupt magnificently or tragically the monotonous trajectory of the matter in the universe. Conversely, anthropocentrism makes of the man an animal species gifted with a transfiguring supplement; he take it from the beings pierced by transcendence as if by an supernatural arrow, marked with a stigma, an openness or a privileged fault (felix culpa) which indelibly differentiate him in the core, in the centre of Nature. When Western philosophy criticizes itself, and engage itself against anthropocentrism, its usual form to deny the human exceptionalism is by affirming that we are on a fundamental level, animals, living beings, or material systems as all the rest — a ‘materialist’ reduction or elimination is the favourite method to compare the human with the pre-existing world. The anthropomorphic principle, by its turn, asserts that it is the animals and the other entities that are humans just like us — a “panpsychist’ generalisation or expansion is the basic method of comparison of the world to the pre-existing human (DANOWSKI; CASTRO, 2014, p.97). BAUMAN. Z. Postmodernity and its discontents. R.J. Jorge Zahar, 1998. DANOWSKI. Déborah. “The hyperrealism of Climate Changes and the various faces of denialism”. In: Sopro, April 2012. DUNKER. C. I. L. Discontentment, suffering, and symptom — a psychopathology of inside walls Brazil. S.P. Boitempo, 2015. FREUD. S. “Civilisation and its Discontents”. In: The Thinkers. S.P. Abril Cultural, 1983. MORTON, Timothy. The Ecological Thought. Cambridge. Massachusetts: Havard University Press, 2010. DANOWSKI. D. CASTRO. Eduardo Viveiros. Is there a world to come? Op. cit. p. 91, note 100. Revista Piauí 97 — October 2014. This world is over. How to live in the Anthropocene, written by Bernardo Esteves. We could cite several convergences between the Amerindians’ scatologies and the West, but the best of them all is surely the book we are talking about in this post Is there a world to come? DANOWSKI. D. Sopro 70. Op. cit. April/2012. Idem. Ibidem. Sopro 70. April/2012. Both concepts borrowed from G. Deleuze e F. Guattari.